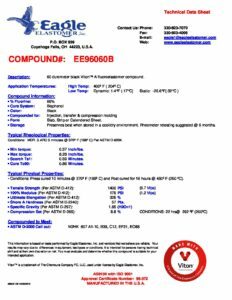 Viton Fluoroelastomer Compound EE96060B - Eagle Elastomer Inc.
 Min torque: 0.37 Inch/lbs.  Max torque: 8.28 Inch/lbs.  Cure Tc90: 0.86 Minutes.